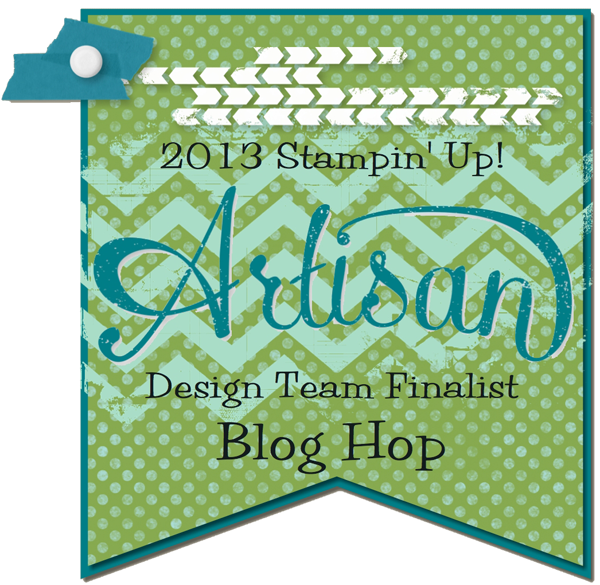 Welcome to the 2013 Artisan Design Team Finalists Blog Hop! We will be sharing all the projects that we submitted to Stampin’ Up for the contest over the next ten days. I can’t wait to share all the projects I poured my heart into for this! This is an AH-mazingly talented group of ladies and I know you will be inspired by all the gorgeous projects! You can choose the “next” and “back” buttons below to get to each designer’s post each day. The first project I am sharing is a card featuring some of my favorite products old and new. I was so sad to see the Shimmer Paint retire in May! I just loved that stuff and used it in many ways! On this card, I “painted” full strength Champagne Mist Shimmer Paint on my White Tea Lace Paper Doily and on at least one of my banners…yummy! My button is made with the White Simply Pressed Clay dyed with Calypso Coral Re-Inker. I sponged the dry button with Soft Suede Ink to give it that vintage look. I used the Canvas Creations for the label shape, I cut it out with a framelit from the Labels Collection. Then I stamped it with the Ship’s Log image from “The Open Sea” stamp set and sponged the edges with Soft Suede. Thank goodness that stamp set is still around, I find myself reaching for it often! 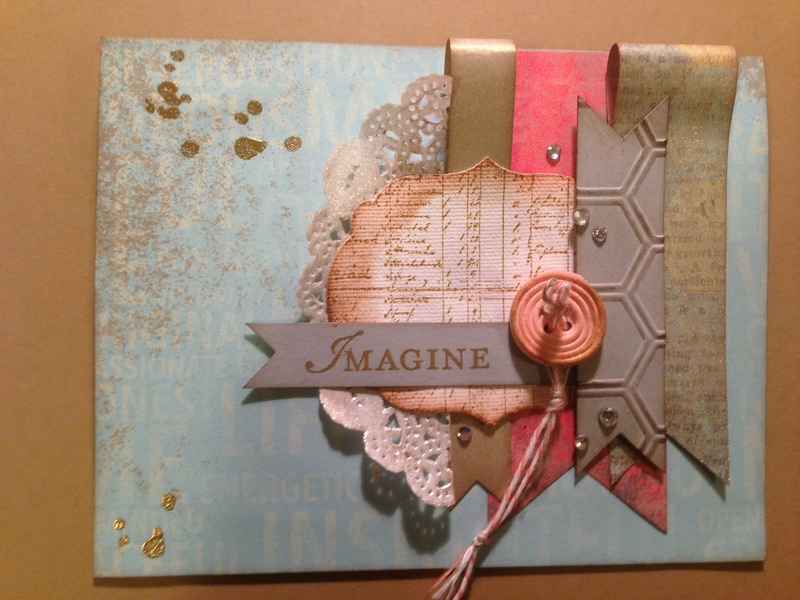 This entry was posted in 2013 Artisan Design Team Finalist, Big Shot, Cards, Framelits Dies, Stampin' Up by kate80132. Bookmark the permalink. I loved the Shimmer Paint too. This is such a cool card! Great start to the hop! This is beautiful! The shimmer paint is perfect. I love how you combined the Open Sea stamp with such lovely feminine details! Beautiful card Cathy! The shimmer paint made this card! I can not wait to see what else you have in store! Truly a beautiful card! Love the effect of the shimmer paint! What a great use for the Canvas Creations! Thanks for sharing! We all won a beautiful friend in you, Cathy! Your projects reflect the beauty in you, that’s for sure! I love all of the little details that you incorporated here and in your other projects! Great card! Very cool looking card ! Nice elements ! I can’t tell you how much I love this. You melted my heart the minute you said paint. Amazing card, love all of the elements and details that went into it! Oh, Cathy! This is gorgeous! All of that shimmer is just beautiful, and I love the layout. I love this card so much. I want it. I want to make it. I looooooove it! Loving your card, especially the gold splotches and of course the sparkly bling! Love that you sponged the doily with our fabulous (and so sadly retired!) Shimmer Paint. Your card is fabulous….